When the bush beckons, it's a wonderful idea to hike one of the three Elephant Hiking Trails. All three routes are a scenic delight with clear streams enticing you to stop, rest, explore and just let mysterious beauty of the forest seep into your soul. The White Elephant Trail has the most enticing rock pool where you can stop for a picnic and even have a dip in summer. But please be sensitive to the environment. The Black Elephant Trail pass through both the Ysterhoutrug and King Edward VII picnic sites and the Red Elephant Trail crosses a little stream exactly halfway ideal for a lunch stop. If you feel really energetic you can link the routes into one long route of 18.2km which takes approximately 6-7 hours to walk. This includes rests, a slow pace and lots of time to look around. Apart from just walking, give attention to the huge yellowwoods, the stinkwood trees that topple over and just keep on growing, the vast variety of fungi, the fynbos, vervet monkeys playing in the tree tops and if you are lucky you might even spot the elusive Knysna Loerie. When finished, linger a little longer by having a braai or a picnic at one of the designated areas at the Diepwalle Forestry Station, the King Edward VII Big Tree, or at the Velbroeksdraai and Ysterhoutrug picnic spots. Diepwalle is also a popular start/finish/overnight point on the Outeniqua Overnight Hiking Trail and there is also a new campsite at the forest station were you can camp on wooden decks amongst the trees. Enjoy and remember your camera! Elephant 1 (Black) 9km, easy, circular route, start at forestry sation. Elephant 2 (White) 8km from forest station or 6.5km from Diepwalle picnic site, easy, circular route. 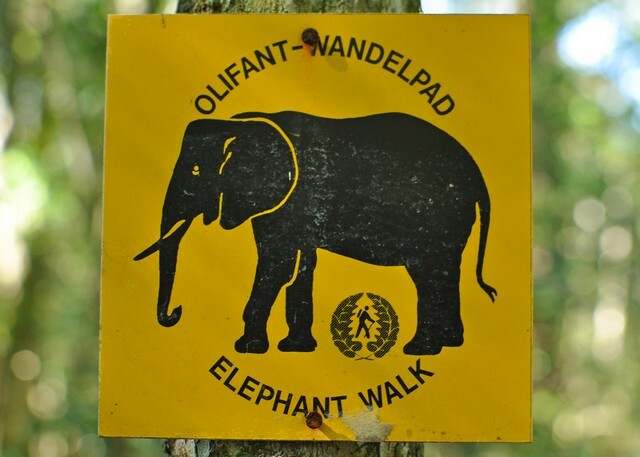 Elephant 3 (Red) 7km, moderate, circular route, start at forestry station. 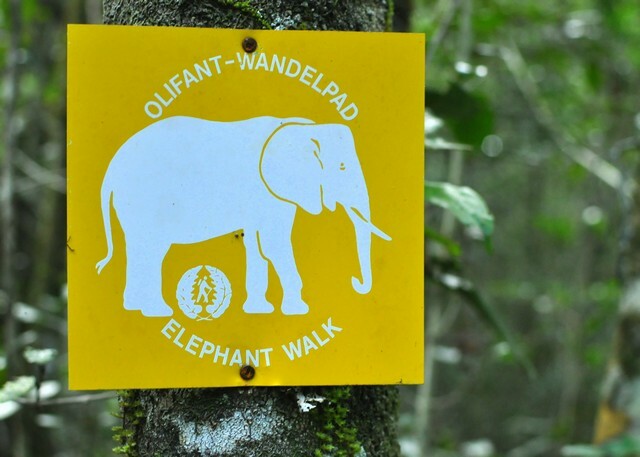 Route markers: These trails follow the Outeniqua Hiking Trail (white/yellow shoeprint) in places, Elephant Walks are marked with colored elephants on yellow plastic signs or on trees. Permits & Cost: Permits are obtainable from the Diepwalle Forestry Station. When the offices are closed issue yourself a self issue permit from the wooden box under the tree in front of the offices. Free for Wild Card members. Directions: From Knysna take the N2 towards Plettenberg Bay. About 4km from Knysna take the R339 Uniondale turnoff to the left and follow this road for 15.5km, take the Diepwalle turnoff to the right. Continue for 1km and stop at Diepwalle Forestry Station. 24KB. Only Garmin GPS units supported, need BaseCamp, MapSource or Trip & Waypoint Manger to open. The last time we did the red trail we did it at night, a great way to give a well known trail a great new twist. Just be prepared, play safe.